Vinification & Aging: The grapes are harvested at the end of August/early September from 15 year old vines. The entire cluster is used in the vinification. The grapes are transferred to tanks, where maceration takes place at a temperature between 50-60°. 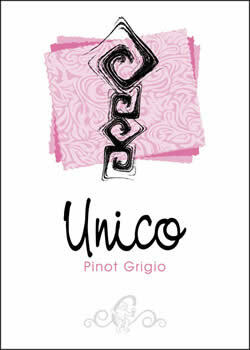 After a soft pressing, the must has an intense pink color, which then becomes the softer pink typical of a pinot grigio rosè. Fermentation takes places for 25-35 days at a temperature of 57-61°. The wine is refermented: the residual sugars from the first fermentation are utilized to make this a ‘vivace’ (sparkling) wine. Description: Pink, bronze. The aroma recalls wild flowers and violets. Delicate flavor with an elegant finish.This a wine appreciated by elegant palates.